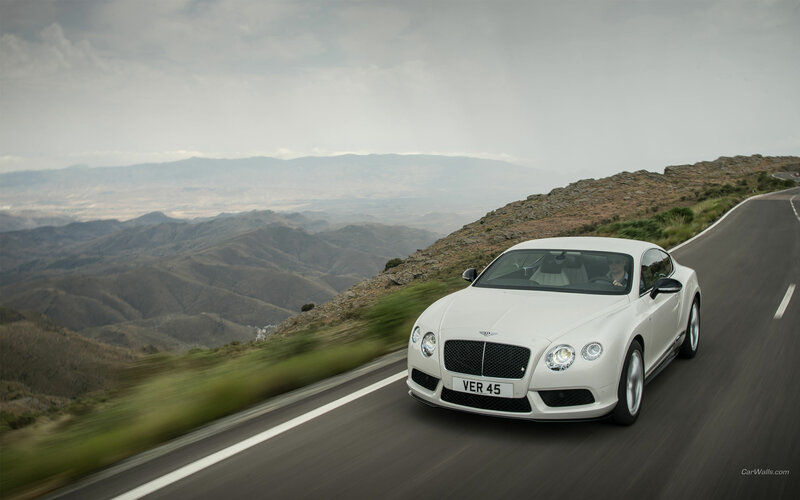 The Continental GT was the first truly modern Bentley and is now the best-selling model in the company’s history. Yet it remains a comparatively exclusive and hugely desirable car. Convertible and saloon versions are available in addition to the GT coupé that we’re testing here. Plus, Bentley offers V8 and W12 engines and an extensive personalisation programme. The first point to note is that this is a four-seater coupé, with the rear two seats as beautifully finished as those up front. And unlike the rear seats in an Aston Martin DB9, which are really only suitable for coats or small bags, the Bentley Continental GT’s are roomy enough to let adults travel in the back of the car for short journeys. There’s also a decent, if not outstanding, amount of storage space up front, most notably a big tray in front of the gear lever. This is supplemented by a pair of cupholders, into which clips a suitably weighty sunglasses case. The boot is big enough to take a weekend’s luggage or a couple of golf bags, although it does have a rather narrow opening, so it could be easier to load. It would be unfair to call any version of the Continental GT uncomfortable, but some models are better at soaking up bumps than others. Specifically, the cheapest one, powered by a V8 engine and without the sporty suspension upgrades found on S models. Combined with minimal wind and road noise, a cultured engine note and wonderfully supportive seats, it makes the car a superb long-distance tourer. The way in which Bentley has taken switches and buttons from its owner Volkswagen and made them work aesthetically in a much posher car is impressive. And the quality on display is sensational, particularly when it comes to any surfaces trimmed in leather. For the most part, the controls are intuitive, too, although it’s worth noting that the Continental GT doesn’t have the latest version of VW’s touchscreen entertainment and navigation system, so in reality, a Golf is significantly more advanced in this respect. A smooth, eight-speed automatic gearbox is fitted as standard across the range, while the steering is usefully light at low speed and the brakes are both linear and powerful. True, the Continental GT’s considerable width takes a bit of getting used to, and you sometimes have to crane your neck to see around the windscreen pillars at junctions. But over-the-shoulder visibility is excellent, and for the most part the car is both relaxing and easy to drive. The fact that four-wheel drive is standard means the Continental GT is also a luxury coupé you can enjoy in all conditions, despite the vast power of its engines. All versions of the Bentley Continental GT will put a smile on your face, both from how fast they accelerate and how much grip they have in corners. The ‘basic’ V8 model goes from 0-62mph in 4.8 seconds, while the top-of-the-range W12 Speed achieves the same sprint in 4.2 seconds. Whichever you go for, it’s an enjoyable car to drive, with nicely weighted steering and a great sound from the engine. However, models with upgraded sports suspension add a slightly firm edge to the ride and are all the worse for it. That’s especially the case considering the Continental GT is at its best as a cruiser, rather than a sports car, when you can revel in the perfectly tuned exhaust note and the surge of power every time you brush the accelerator. Bentley’s warranty covers the car for three years, no matter how many miles you do, which is better than the cover that Porsche offers on its 911. However, it doesn’t match what Ferrari offers on its California T.
Servicing is required every 12 months or 10,000 miles, whichever comes first. The Bentley Continental GT is a big, heavy car, plus the W12 and Speed versions have 12-cylinder engines that produce more than 600bhp, so you won’t be surprised to hear that they drink super unleaded like it’s going out of fashion. It’s another reason why the entry-level V8 model is the best buy, for as well as being naturally less thirsty, it can shut down four of its eight cylinders when they’re not required, a seamless process that means you can coax 20mpg or more out of it. That’s enough for a range of about 400 miles between fuel stops. Front and side airbags are fitted, as is a stability control system that will help you to recover the car if it begins to skid. You’ll have to be going some to make it do that, though, because the standard four-wheel-drive system ensures the Continental GT feel terrifically stable despite its huge reserves of power. In addition, Bentley can supply the car with winter tyres, making it a genuine year-round proposition. What the Continental GT lacks is the latest round of advanced safety systems, such as one that will automatically apply the brakes to stop you hitting the car in front.